We are your Japan travel expert. Experience our authentic Japanese hospitality before you visit Japan. Japan has become one of the most popular travel destinations in the world. People who are visiting Japan for the first time will have a lot of expectations. Japan will not let you down. It is full of charms such as the stunning scenery, four clear and distinct seasons, culture, food, people, train system, Japanese hospitality and more. If you have already been to Japan, you may have already been tempted to visit Japan again and again. Its attraction is endless. Japan Explorer is a Japan travel expert. Our Japan travel specialists will help you to organise your holiday the way you want to travel, so you can go where you want to go, see what you want to see and do what you want to do. We can help with whatever you desire for your holiday in Japan. Reading guide books, collecting information, contacting travel agencies, your Japan travel experience has already started. From planning to departing, we will take care of you and your travel arrangements in fine detail. Stress-free planning and organising proper accommodation for your budget, Japan is our specialty. Talk to our specialists and tell us your wishes in Japan. We will provide you with customised and personalised travel arrangements and a suggested itinerary, helping you in your navigation of Japan. Travelling with us, you will have an authentic Japanese experience! Before you go to Japan, experience our Japanese hospitality and quality service. We are passionate about Japan and are pleased to share our knowledge of how wonderful a place Japan is to travel. We have extensive experience in the travel industry both in Japan and Australia. 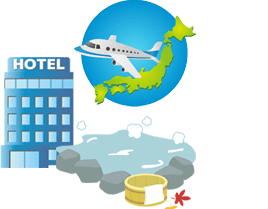 While in Japan that experience was built in providing travel services to Japanese people for travel within Japan, so we have to know our stuff. Our knowledge is deep and wide ranging so even if you’ve been to Japan before, we can ensure your trip provides new experiences every time you visit. We take pride in our ability to gather new sightseeing information and activities in a rapidly-changing travel industry so we can always provide professional assistance to our customers. If you know what you want to see, we can prepare your itinerary for you and book the right hotels so you can maximise your experience in Japan.